This is next on my list! Looks absolutely delicious. Thanks for the idea, can’t wait to make it. What kind of honey do you use? Should it be something light, like Acacia, or a more robist flavored one? I just use regular store brand honey. 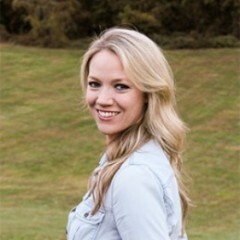 Hi Sheila, if you are looking for a healthier honey? I recommend Tupelo honey! It doesn’t spike blood sugar! I tried this and it had great flavor but I couldn’t get the sauce to thicken. I’m new to cooking, so it may just be me, but is there a trick I don’t know about? And I made this with white rice, but my husband said it would be better with sticky Asian rice, is that a thing? Or just cook the white rice different? I’m sorry this did not thicken for you! If it is not thickening up enough you can always add more cornstarch in (mixed with cooking liquid). You can also let the sauce cook more in the slow cooker before adding the chicken to help thicken up the sauce. I love sticky rice, but never made it. Sticky rice is definitely an art form and can take some practice to get just right. Cornstarch in cold water will thicken. Depending on what you make….1/4 cup cold water to heaping tablespoon of cornstarch. If you need more,make another quater cup and add gradually as needed. Thank you for that tip! I was having the same problem and adding cornstarch was not working-saw your comment-tried it-and perfect!!!! Hi – looks delicious! Can I prepare in the slow cooker the night before and leave all ingredients refrigerated in the slow cooker overnight and take out and turn on tomorrow a few hours before dinner? I am always hesitant to leave raw meat with other ingredients mixed up overnight. There is also a possibility of the slow cooker insert breaking because of the cold to warm temp change. I would suggest prepping the sauce ingredients the night before and just throwing the chicken and the sauce in the day of. Little late to the party, but you could put all of the ingredients in a crockpot liner bag. Just tie off the top, or use rubber bands to seal it. Then you can pull it from the fridge at your convenience. Might want to keep the chicken in a separate Ziploc bag until cooking time. Should the slow cooker be on the highest low setting? You want to cook it on the lowest setting (not warm). 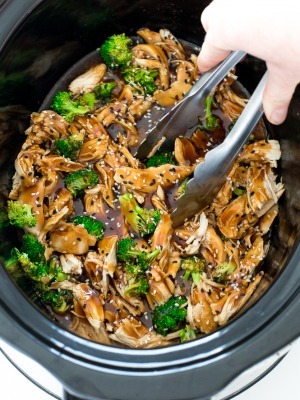 Have you ever put the chicken breasts into the crockpot frozen? Just wondering how much longer to cook it? I have not tried doing this so it is hard to say. I would say maybe 1 or 2 additional hours. I did that tonight and my chicken came out rubbery. Besides that, the recipe was delicious! 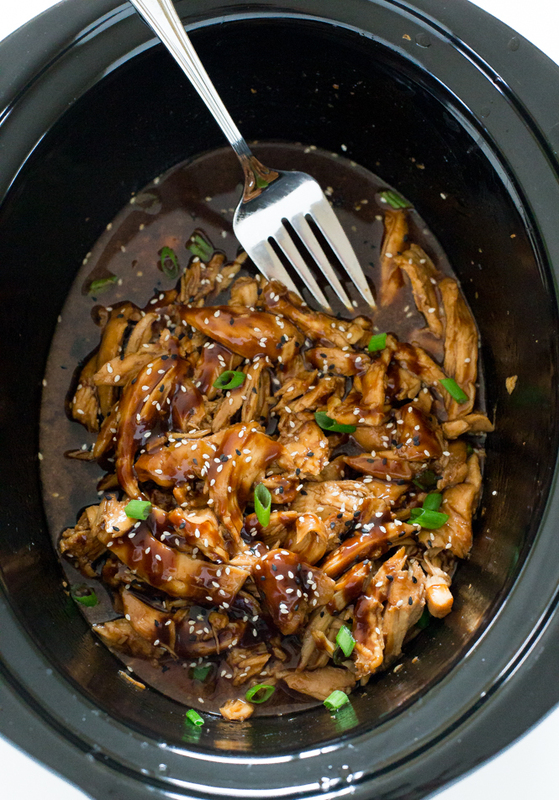 If its frozen you need to cook on low for at least 5-6 hours in a slow cooker. I do that, and it turns out just fine. The only problem is the sauce will not thicken since there will be more liquid added from the frozen chicken, so you will need to add sauce to sauce pan after and bring to boil for a couple mins (while stirring) and then it will thicken. Really amazing! Tastes great over sticky rice with broccoli! Very simply to make. My family loved it! Nice cooking, should be very delicious ! Good flavors, but it never thickened for me. Added more cornstarch and never got it to look anything like the pictures. Shame because I’m sure it would have been amazing. I am sorry it didn’t thicken for you! You can always take out some of the extra liquid and thicken less of the sauce. This should help it thicken. 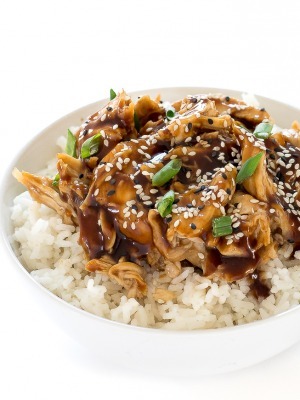 What if you don’t have hoisin sauce? Any substitutions for this? Thank you! I use the Roland brand sesame oil. The one I have at home does not say light or dark on the bottle. I would go with light sesame oil if that is all they have at your grocer. Bought some beautiful bok choy at the local farmers market. Now build a dinner around bok choy apart from s stir fry. Husband loved it. He thought he was in a Chinese restaurant. A very easy dinner. I used thighs fillets as that is what I had. A very easy tasty dinner with some rice. I’m finding rice vinegar and red or white wine vinegar but not rice wine vinegar? Which is better to use? The rice wine vinegar will be in the international foods section of the grocery store. So look buy the soy sauce. If you are in a pinch I would just use regular white vinegar. Rice vinegar is the same thing as “Rice Wine Vinegar”, it’s just different wording. Made this tonight and it was a big hit with the hubby and I. I had to use a lot more cornstarch then the recipe called for but it did thicken and was delicious. Thanks for a great recipe which will be a regular in our home! Is there nutritional information on this recipe. It sound so good, but would like that information. Thank you very much for taking the trouble to look up or get a site that can help with the nutritional information. The recipe sounds so good. 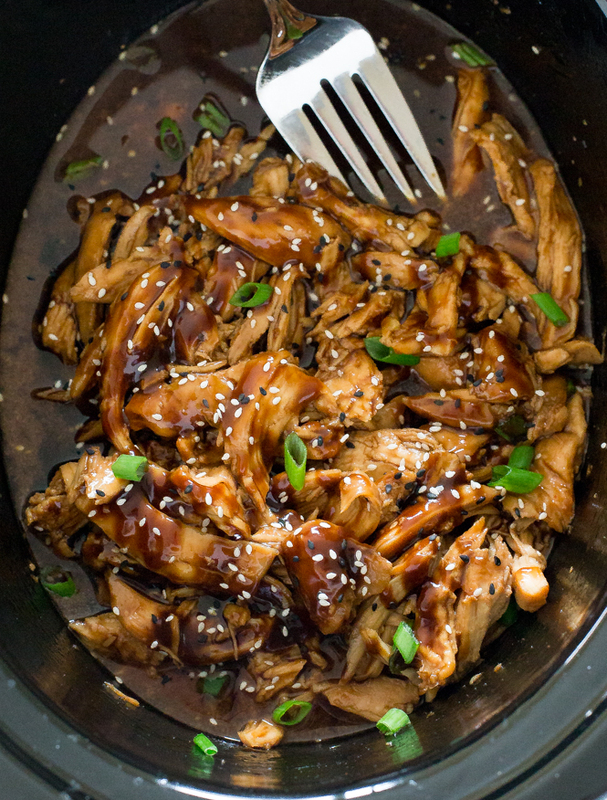 Is it possible to leave this in the crockpot all day? Or will the chicken go too tough and dry? I am working all day tomorrow so wont have time to put it on in time in the evening. I would worry that this would be too dry if cooked all day. 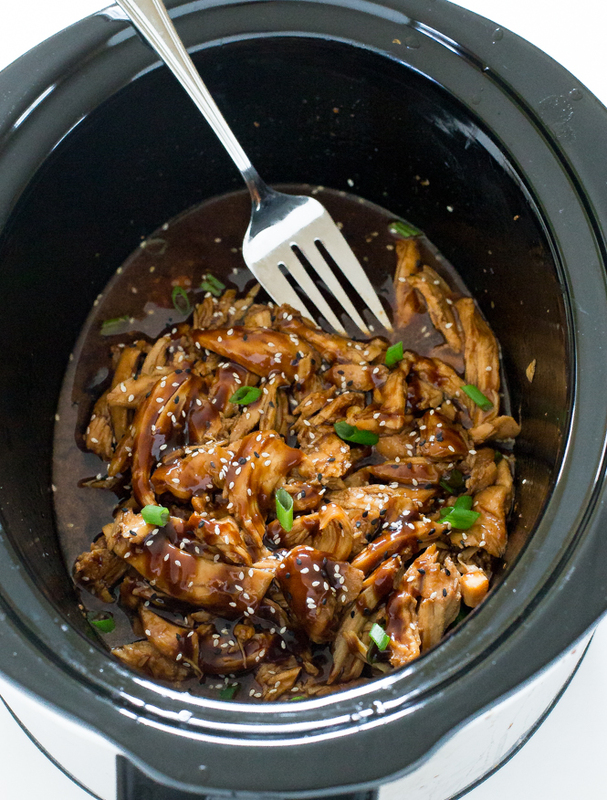 Do you have a crockpot that you can set the time for? You can cook for 2-3 hours on low then keep on warm for the rest of the day. I tried that and came hinge to what looked like s cooked sweet potato. The smell was so bad I smelled it when I pulled into our garage. Seems like everyone had the problem of the sauce not thickening. I had the exact opposite problem,to thick. What can I add to juice it up? 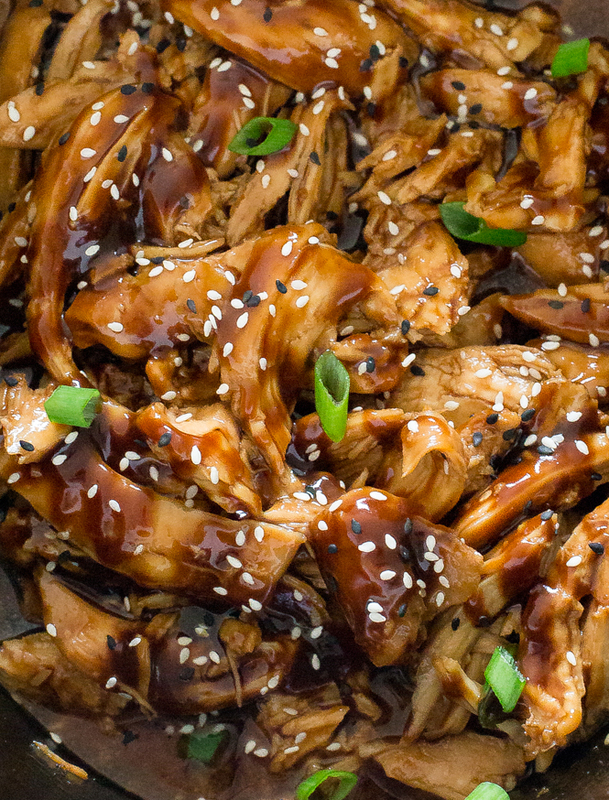 More hoisin? I would try adding a bit of water plus a bit more soy sauce. I made this tonight as well but I added broccoli into the crock pot. Worked like a dream! to thicken the sauce quickly, I added the cornstarch and microwaved small portions of the sauce for about 25 seconds. Thickened instantly. Love this! I am very pleased thst i stumbled over This recipe. 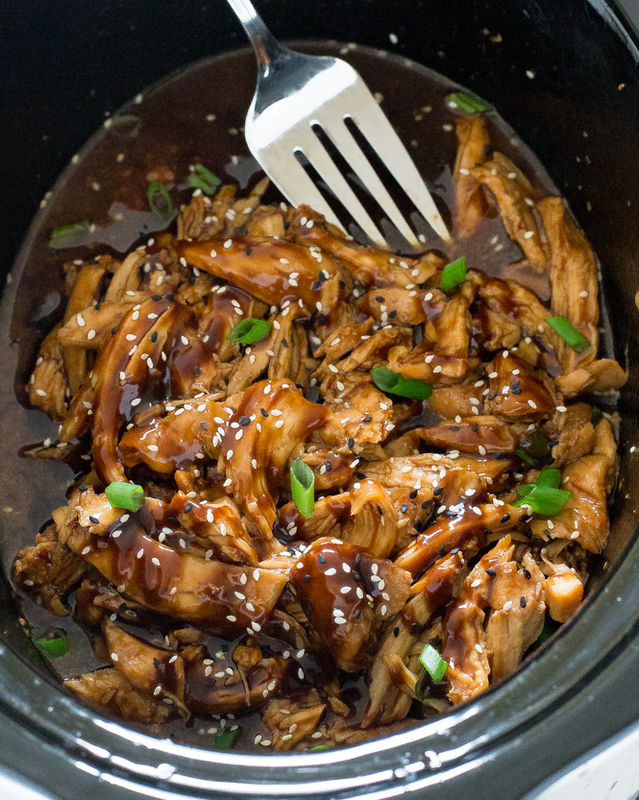 This is the second recipe I’ve tried in my slow cooker, I’m a newbie at this, I loved this recipe, I was worried at first because the chicken didn’t look like it was cooking but all turned out fine after the 3 hours. My sauce didn’t thicken like in the photo, but that was fine with me, gave me something to pour over my rice for added flavour. I would not double the amount of cooking time. I would try cooking for 2-3 hours and then checking to see if it is done. Sauce would have a hard time thickening on its own. Especially in a crock pot on low. Recommend boiling and stirring briskly then slowly bringing temp down over 7-10 mins. My sauce diluted a bit from chicken juices as well. Had to keep in mind this would be seasoning the chicken as well as bland rice or noodles. I added a bit more soy and honey. I also put a TBS of orange marmalade in. Where do you use the sesame oil? It is used with the rest of the sauce ingredients.